Watch for additions as the project continues. This Listening Session shares the basics of the Job Framework Redesign Project and how it benefits staff at IU. This session also features an example of how the new framework is constructed, including an explanation of job functions and families (PDF). 1,000 IU employees attended a spring 2018 Listening Session in-person. This Listening Session shares an update on the continuing work on the Job Framework Redesign Project. 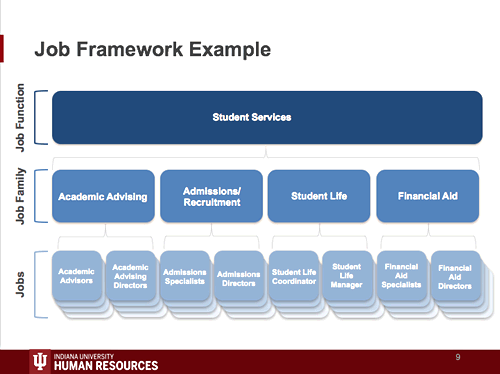 In this session, you will learn about new role descriptors (PDF), career levels, titles, and more elements that will help create a modernized job framework for IU staff. More than 1,100 employees attended a fall 2018 Listening Session, with over 400 participating in an online session. A single page PDF containing the basics about the Job Framework Redesign Project to share and post in staff areas. A document that illustrates the basic structure of the new job framework. The spring 2018 Listening Session provides a full explanation of job functions and families. Annotated presentation slides that accompanied the spring 2018 Listening Sessions. 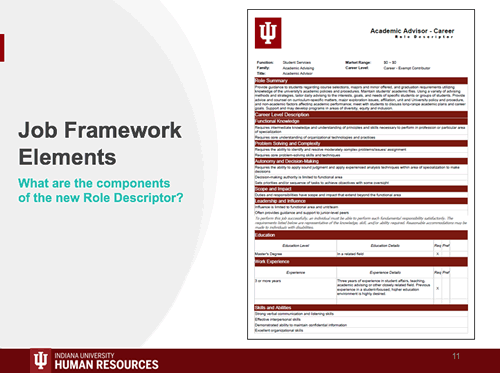 A document that provides an example of a new role descriptor, which will replace position descriptions at IU. The fall 2018 Listening Session provides a full explanation of a role descriptor. Annotated presentation slides that accompanied the fall 2018 Listening Sessions. These show the typical work dimensions involved in career levels for each career structure.